Top Lodge in Blantyre presents a choice of 12 executive rooms all of which are self–contained and equipped with satellite television, internet, air conditioning and other facilities. 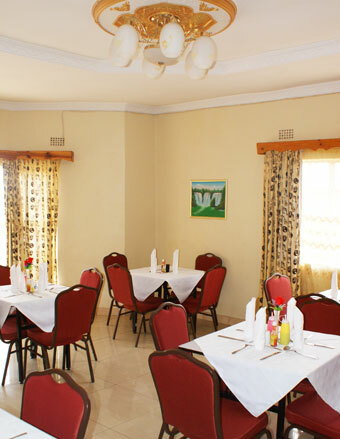 They range from standard to deluxe to give our guests a choice for their comfort. We will serve our guests with a friendly demeanor. We will greet them with a genuine smile. At all times, we would like to know whether our guests’ needs are being met and, if not, we will immediately remedy the problem. Guests should expect clean linens and a neat and attractive room without having to request it. Guests are treated as though they were guests in the manager's home. Staff will instinctively know to place customer needs above their own and never be too busy to help. Guests are served with total respect at all times. Guests are treated as our “ambassadors” in that they are capable of bringing more guests to Top Lodge through their personal and business networks based on the top class service we give them. Top Lodge will ensure that the personal safety of guests is not compromised at all. This will apply to physical premises, equipment, food and beverages, motor vehicles and other guests that they get in touch with.